Edge Hill has recently unveiled a new coat of arms to mark the institution’s long tradition of higher education. The heraldry tells the story of Edge Hill using the Red Rose of Lancashire and the Liver Bird, to reflext the University’s current location in Ormskirk, while looking back to the institution’s original location in Liverpool. Edge Hill’s ideological origins are represented by the green and heliotrope (purple) of the sufragette movement and the use of gold, which is associated with generosity and elevation of the mind. 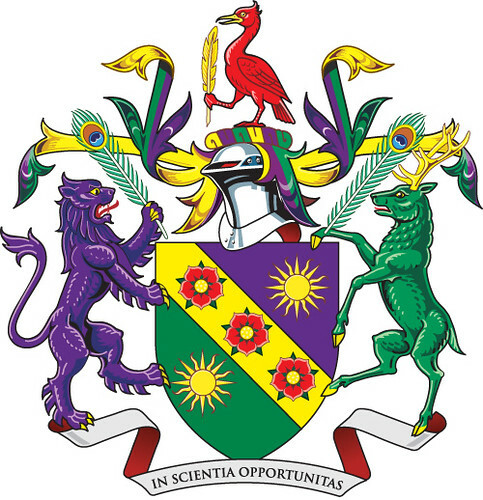 The coat or arms also include the Edge Hill motto – “In Scientia Opportunitas” – which translates as “In knowledge, opportunity”. Supporting the shield are a lion, representing strength, bravery and magnanimity, and a stag, symbolising wisdom, regeneration, peace and harmony. This entry was posted in Logos and tagged campus link, coat of arms, history, logo, sufragette by Mike Nolan. Bookmark the permalink. The coat of arms isn’t intended to be an every day thing – it’s reserved for special occasions like graduation ceremonies. Some universities use theirs in place of any other logo but that, to me, doesn’t feel very “Edge Hill”.